I have decided to give my blog a fancy name. I have been blogging for nearly six months now and it appears not to be a passing whim, so I thought I would lose the arbitrary title of 'My Diary'. Also, I have developed blog envy for places like Curlew Country. So... what to call it? The phrase 'herding cats' is mentioned in one of my early posts. It describes something that is difficult and frustrating, walking with a toddler captures the essence of the phrase. It is the way I feel about my life currently. I am of the opinion that if you forget about the destination and enjoy the meandering you get much more out of life. It has absolutely nothing to do with cats- I am actually more of a dog person. 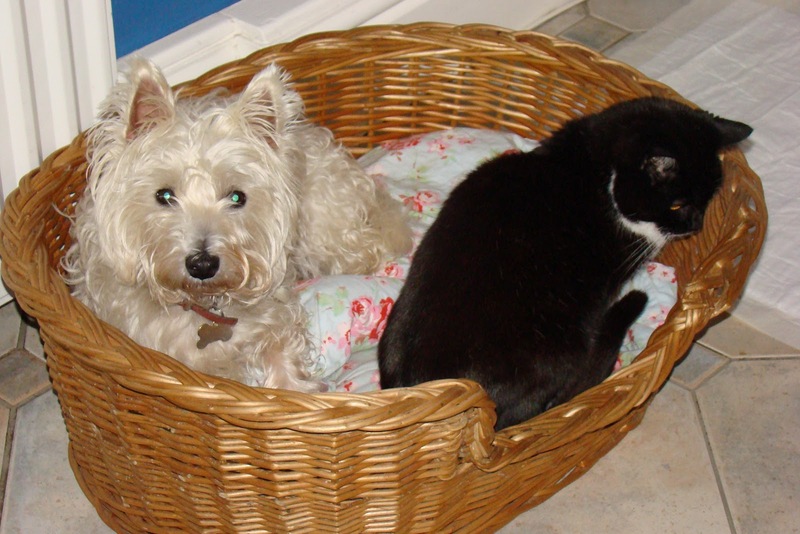 This is Moomin bedding down with our old cat Phoebe. She was a lovely cat in many ways, very friendly and loving but she was also old and a bit cranky. Craig still shows people the scar on his arm from a particularly vicious swipe. She was euthanised a couple of months after this photo after developing a facial cancer. Now we are a dog family with all the unconditional love and slobbering that that entails. Better go jump in the shower before nursery ring me up to come and pick up our snotball. Nice to do some blog 'housekeeping' though.